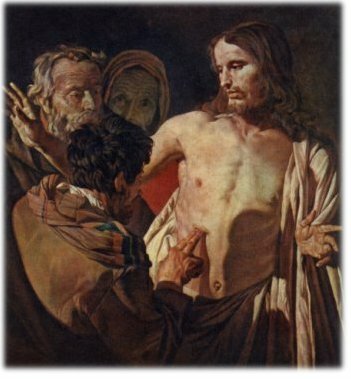 Thomas says to Him, "My Lord and my God"
1. I adore Thee, O my God, with Thomas; and if I have, like him, sinned through unbelief, I adore Thee the more. I adore Thee as the One Adorable, I adore Thee as more glorious in Thy humiliation, when men despised Thee, than when Angels worshipped Thee, Deus meus et omnia "My God and my all". To have Thee is to have everything I can have. O my Eternal Father, give me Thyself. I dared not have made so bold a request, it would have been presumption, unless Thou hadst encouraged me. Thou hast put it into my mouth, Thou hast clothed Thyself in my nature, Thou hast become my Brother, Thou hast died as other men die, only in far greater bitterness, that, instead of my eyeing Thee fearfully from afar, I might confidently draw near to Thee. Thou dost speak to me as Thou didst speak to Thomas, and dost beckon me to take hold of Thee. My God and my all, what could I say more than this, if I spoke to all eternity! I am full and abound and overflow, when I have Thee; but without Thee I am nothingI wither away, I dissolve and perish. My Lord and my God, my God and my all, give me Thyself and nothing else. 3. O my God, though I am not fit to see or touch Thee yet, still I will ever come within Thy reach, and desire that which is not yet given me in its fulness. O my Saviour, Thou shalt be my sole God!I will have no Lord but Thee. I will break to pieces all idols in my heart which rival Thee. I will have nothing but Jesus and Him crucified. It shall be my life to pray to Thee, to offer myself to Thee, to keep Thee before me, to worship Thee in Thy holy Sacrifice, and to surrender myself to Thee in Holy Communion.